A road trip can be as simple as jumping in the car and driving or you can pack everything but the kitchen sink. Other than a vehicle, there isn’t much extra gear that you have to have but there are some things that make the trip safer and more enjoyable. This isn’t a complete road trip guide but more of the gear that you may not already have. You can download a comprehensive road trip packing list, with camping option, for yourself and dogs by clicking here. Get your emergency kit here. I keep a first aid kit in my car at all times stored next to my emergency kit. This is another piece of equipment that you can buy already assembled although some are more like trauma kits than first aid. I mean, how often have you needed to suture a cut on the side of the road? Bandages, absorbent pads, and adhesive strips are the bare minimum you need. If you want to buy a pre-made first aid kit, you’ll find several here. It’s amazing how quickly a car can heat up in the sun. There’s nothing quite like the feeling of climbing into the car only to leap back out when you feel scalding hot car seats on bare legs. A reflective cover can help to slow the car from heating up like an oven. Many windshield covers have a shiny side and a dark side: shiny side out to reflect the sun and dark side out to absorb heat in the winter. 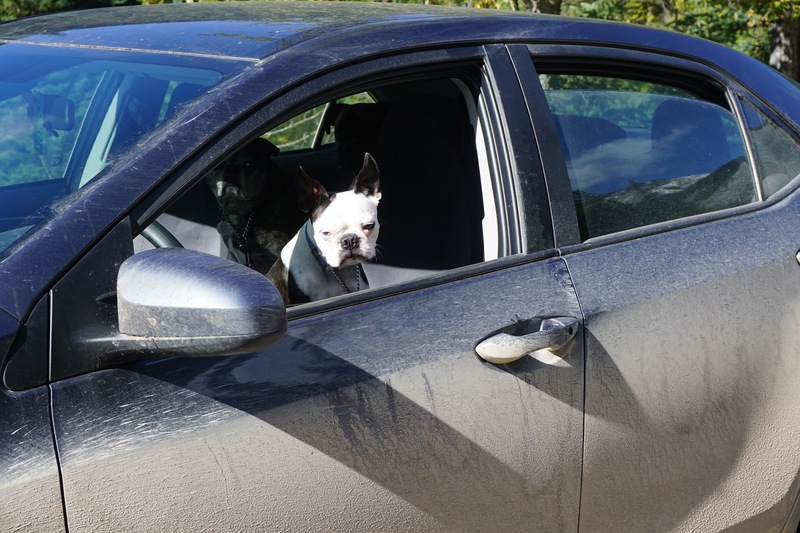 Roll-down window covers can provide some shade for passengers in the rear of the vehicle, especially the four-legged kind that may be trying to sleep while you do all the driving. This doesn’t mean that you can leave kids or pets in the car but it will make it a little less unpleasant when you get back to the vehicle. Click here to shop for windshield covers and find window covers here. Space is often at a premium in small cars or when you have several passengers. A cargo box mounted on the roof of the vehicle can provide extra space for gear or help transport larger items that wouldn’t fit in the trunk. Shop for cargo boxes here. Bringing food on a road trip cuts costs down tremendously and if your passenger list has small children, snacks are almost mandatory. A well-packed cooler can keep food and drinks cold for days. It’s also great for bringing edible souvenirs home. Chill out with coolers here. I drink a lot of coffee when I’m travelling. A travel mug keeps my drink hot between stops and helps to cut down on waste. Some restaurants and cafes offer a discount when you bring your own mug too. On a personal note, I like the Contigo Autoseal mugs. The mug stays sealed until you push a little button when you drink. It’s just one less way that I can spill hot coffee down my front. Click here to shop for travel mugs. It seems inevitable that when something goes wrong, it will go wrong in the dark. While most cell phones have a flashlight function, holding a cell phone while trying to do anything is almost impossible. I prefer headlamps which leave both hands free but even a large flashlight can be tucked under an arm. Light up your life with headlamps here and flashlights here. I think every province in Canada and state in the United States has laws against distracted driving, meaning hands-free cell phone use only. Leaving a cell phone in the cup holder will do in a pinch, but having it easily visible in a holder is a much better, and safer, option. Click on this link to shop for phone holders for your car. Let’s face it: we can’t function these days without our cell phones and they will inevitably run out of battery the minute you really need them. Keeping a spare cable in the car means that your phone will stay fully charged for every selfie and route change. Search a selection of cell phone cables with this link. Picnic tables and benches are great but they’re not always comfortable and are difficult to move. A collapsible chair is much more comfortable and gives you tons of flexibility when stopping for a rest. Director-style chairs often come with a tube-shaped carrying case which makes them much easier to pack into a trunk (or even the backseat) than the chairs that fold flat. Pull up a seat and click here to find a camping chair. Rather than buying bottles of water, I keep a stock of insulated water bottles in the car and fill them up at rest stops and restaurants. I like the insulated kinds because the water stays cooler much longer; a real treat on a hot day when you come back from a long hike. Large-mouth bottles are easier to fill with water and even ice cubes. Get your water bottles here. These things are AMAZING! I keep one in the car and one in my desk at work. I can throw it in my pocket and I’ve always got a reusable cup handy since I keep forgetting to bring my travel mug with me. It doesn’t keep beverages warm as long as insulated mugs but that is far outweighed by convenience. Splurge on a collapsible coffee cup here. Leaving electronics plugged into the car when it’s not running can drain the battery. One way to avoid that and keep devices charging all the time, it to use a solar charger. It can be put into whichever window is getting the most sun or for you lucky folks with a dedicated travel vehicle (I am so jealous), you can attach panels to the roof. Power up your life with solar chargers here. If you want food and drinks to stay cold without messing around with bags of ice or ice packs, a plug-in cooler is a handy item. They come in various sizes and some even have a function for keeping food warm, great when you’re bringing a dish to a function or want that leftover BBQ lunch for dinner. I have a smaller Koolatron cooler that fits behind the front passenger seat which means I can easily access cool drinks as I drive. Want to add a cooler to your gear? Click here for coolers. Finding a shady place to eat or relax can be tricky. A collapsible awning is a great way to get out of the sun or provide shelter from the rain. You should have a spare tire in the car but sometimes, your tire just needs a little hit of air or you don’t want to unpack the entire contents of the trunk to get to your spare. For a slow leak, a pump that plugs into the charging port (let’s face it: they aren’t cigarette lighters anymore. I’m dating myself) will have the tire good to go in no time. The pump can also quickly inflate air mattresses or water toys without you needing to blow out a lung. Another option for a flat tire is a can of tire sealant. This is a great shirt-term option but it means that the tire will have to be replaced instead of repaired. Get pumped here and find tire sealant here. 3 response to "Ultimate Road Trip Gear Guide"
I love this list and I can see you using every object on it. Well done.